I recently took my neighbor Todd to visit AKA, An American Bistro, restaurant in Old Town Pasadena. 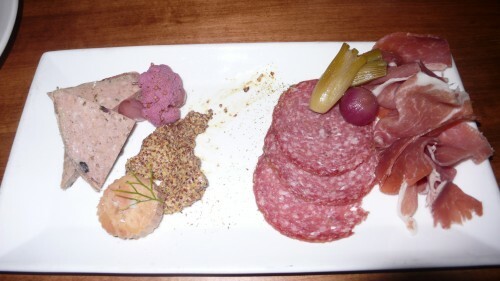 The new eatery opened in mid February in the old Gordon Biersche space. The classic American tavern has exposed brick walls, floor to ceiling glass doors opening to the outside courtyard, huge butcher block tables and cozy booths, a large bar area and a back area wine cellar. 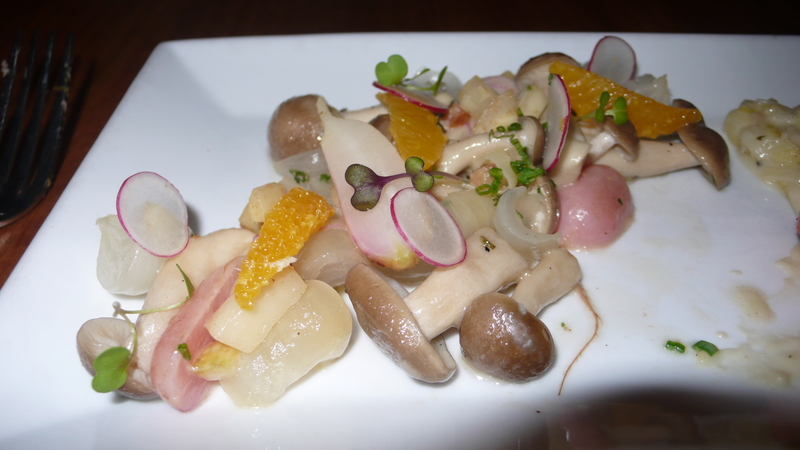 Chef Jonathan Weiner cooked us some delicious food, here is a sampling of what we tasted. Owner Robert Simon stopped by and recommended we try the famous portobello fries. Prior to the Pasadena AKA, Simon owned the original outpost in St. Helena which has since shut down. 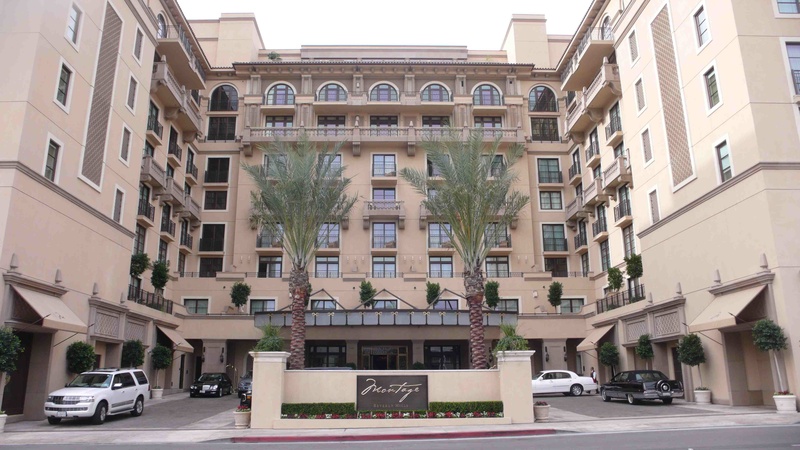 Robert and his wife Deborah also own the well-known Bistro 45 in Pasadena. 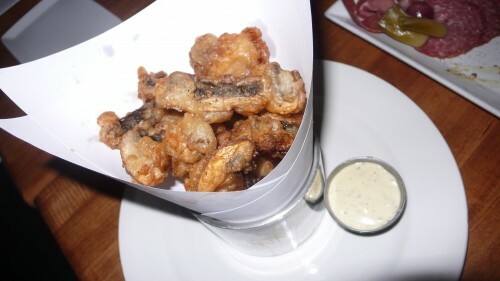 Our crispy fires were delicious and served with a creamy truffle aioli. We could have eaten a barrel of these. Next came a nice charcurterie plate with homemade mustards and salami, as well as a country pate, foie gras, parma prosciutto and olives. All delicious. 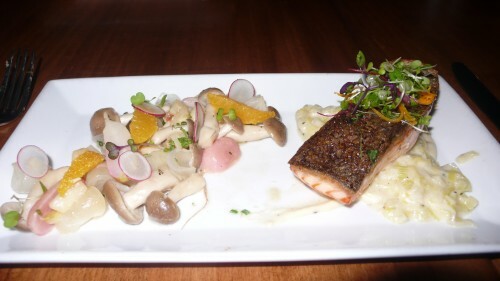 I ordered the pan seared Scottish salmon, which came with a great side salad of baby mushrooms and vegetables. The salmon was cooked perfectly and had a nice crispy skin. My neighbor Todd had the huge grilled double cut fresh pork chop. It was awesome in size and in taste. Served with brussel sprouts, carrots and apple butter, we devoured it. 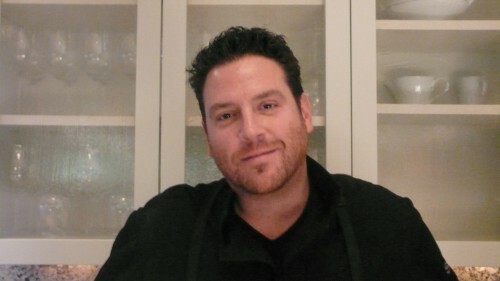 Before dessert, Chef Jonathan Weiner came out to say hello. 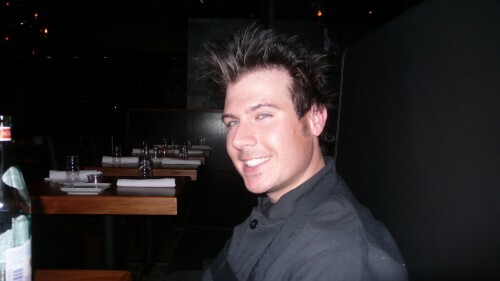 We were surprised how young he was as the food reflected a chef with a vast amount of experience behind the kitchen. He shared with us that AKA tries to utilize organic sustainable products as much as possible and makes house specialties such as the mustards, chorizo and salamis. 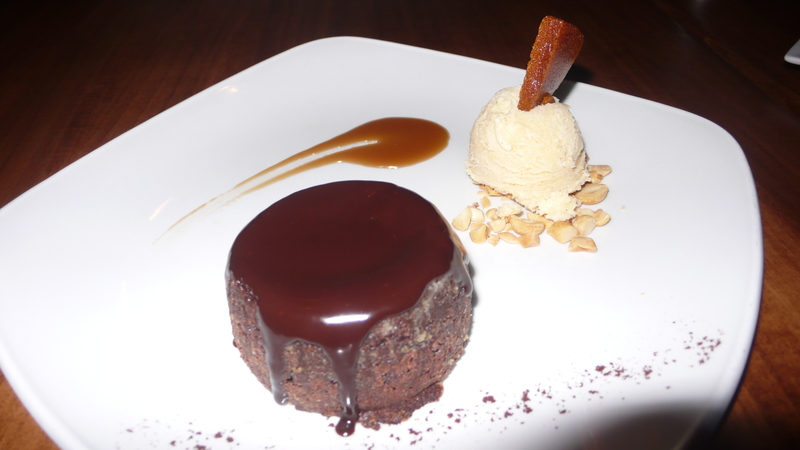 Chef Wiener then sent out a warm chocolate cake with home made peanut butter ice cream. A great way to end our lovely meal. 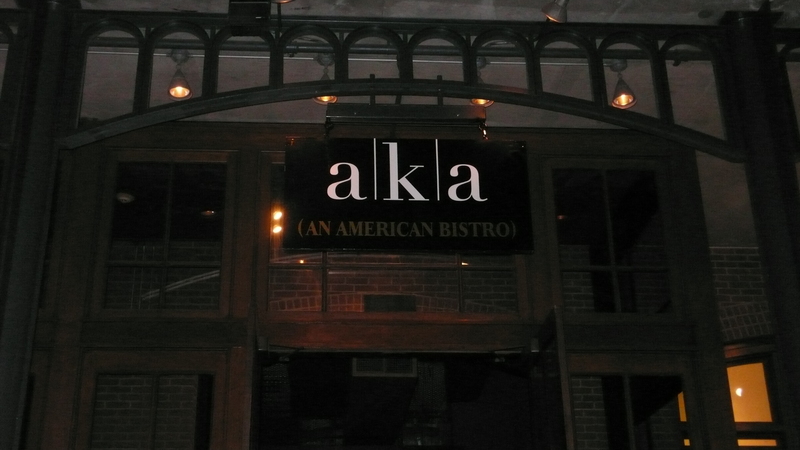 I highly recommend stopping by AKA next time you visit Old Town, to sit outside and enjoy an appetizer and a great glass of wine or to have a leisurely dinner with excellent comfort food. 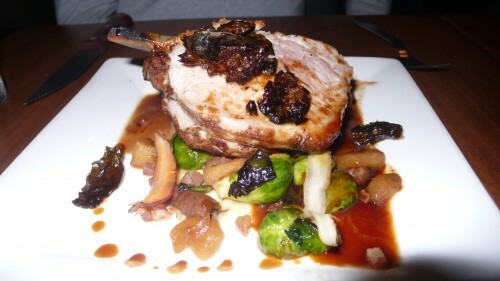 Reservations recommended, 41 Hugus Alley, at One Colorado in Old Town Pasadena, 626/564-8111. A few weeks ago, I attended the premier viewing party for the new season of Food Network’s “24 Hour Restaurant Battle.” Hosted by restauranteur and chef Scott Conant, the show teams up and coming restauranteurs against each other in a battle for $10,000. Each team must open their own restaurant from scratch in 24 hours. The winning team is chosen by Conant and a panel of three food industry insiders. 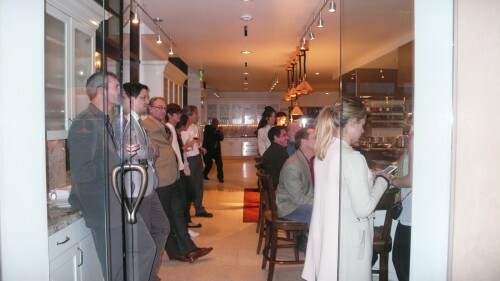 The party was held at Conant’s Scarpetta restaurant in the upscale Montage Hotel in Beverly Hills. Scarpetta Beverly Hlls is one of five scattered across the country bringing Southern Italian cuisine to diners. The restaurant has three dining areas, a big main room, a large bar and a courtyard patio across from Thomas Keller’s Bouchon. I joined food writers and bloggers in the open kitchen. I was a bit apprehensive about meeting Chef Conant, as I couldn’t recall him smiling on any of the Food Network shows where he appeared as a judge. I was pleasantly surprised when he approached me and my friend Nicole with a big smile and a plate of appetizers and thanked us for coming. 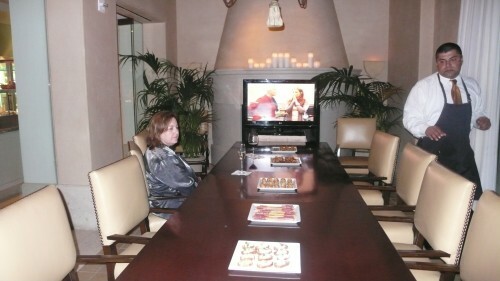 Guests gathered around a large flat screen TV in the kitchen to watch the first episode of the new season. We were asked if we wanted to sit in the back at the large chef’s dining room where the big table was set with a variety of appetizers. 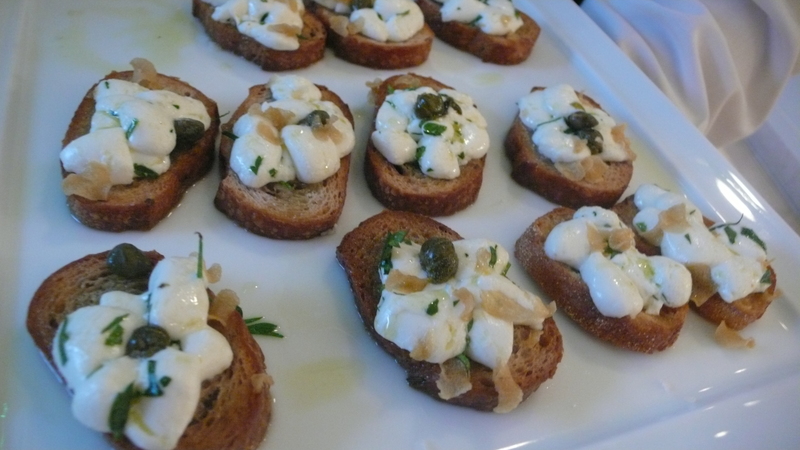 We started with some creamy mozzarella on toasted bread. We also had parma ham wrapped around breadsticks. 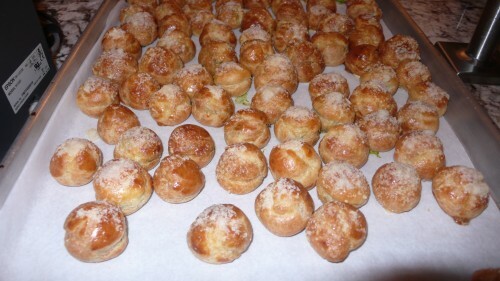 Then came fresh baked bread balls. 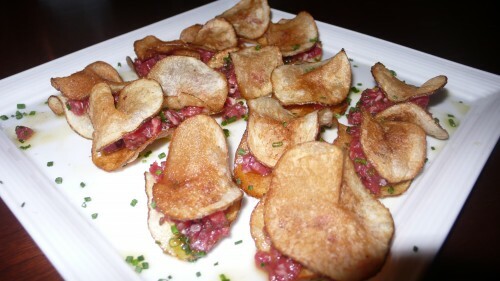 Next came tuna tartar on potato chips. We loved these. Conant’s specialty is his pasta. 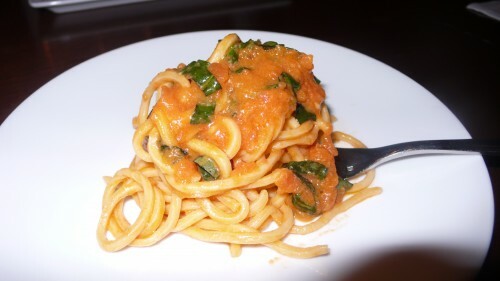 The spaghetti was delicious. We had two servings. 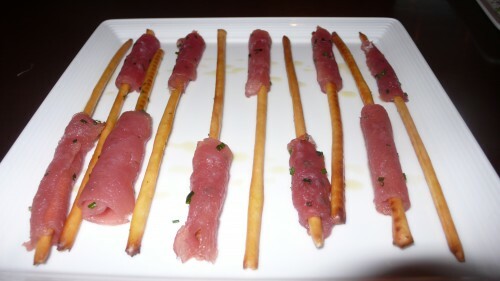 We left knowing that based on the appetizers, we would be back in the next few weeks to have a full dinner at Scarpetta. 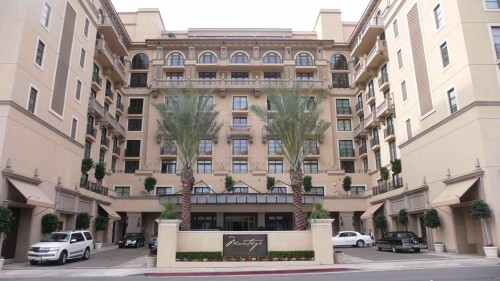 Scarpetta is located in the Montage Beverly Hills, 225 North Canon Drive, 310/860-7970.